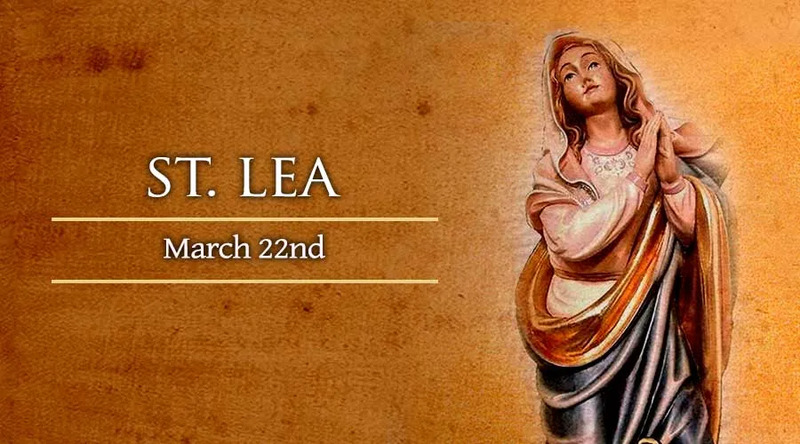 March 22 is the liturgical memorial of Saint Lea of Rome, a fourth-century widow who left her wealth behind, entered consecrated life, and attained great holiness through asceticism and prayer. Though not well-known as a figure of devotion in modern times, she was acknowledged as a saint on the testimony of her contemporary Saint Jerome, who wrote a brief description of Lea's life after she had died. Jerome, a scholarly monk best known for his Latin translation of the Bible (the Vulgate), is the Church's only source of information on St. Lea, whose biographical details are unknown. St. Jerome eulogized her in a letter written during the year 384 to his student and spiritual directee Marcella, another Roman consecrated woman who had left her aristocratic life behind after being widowed. It is clear from his letter that Lea was a mutual friend to both Jerome and Marcella. Jerome states that his account is written to “hail with joy the release of a soul which has trampled Satan under foot, and won for itself, at last, a crown of tranquility.” Jerome also contrasts the life of “our most saintly friend” with that of the late pagan public official Praetextatus, held up by Jerome as a cautionary example. Jerome's letter goes on to compare her fate to that of Praetextus – who died in the same year as Lea, after spending his life promoting a return to Rome's ancient polytheistic pagan religion. The monk retells Jesus' parable of Lazarus and Dives, with Lea in the place of the poor and suffering man. Thus Lea, “who seemed poor and of little worth, and whose life was accounted madness,” triumphs in salvation. But the punishment of infidelity falls on the consul-elect – who had led a triumphant procession just before his death, and been widely mourned afterward.